Somewhere between 30 and 40 Montanans attended the Break Free from fossil fuels actions. We varied in age and backgrounds. We are retirees, students, and professionals. All of us thought it was very important to connect with climate change activists in neighboring states. We met people from other 350 chapters in Washington and Oregon and most of us camped together in a beautiful state park near Anacortes. There were lots of seminars and trainings. A climate change conference also occurred for people in town, and everyone gathered on Saturday night for a salmon dinner and some great speakers. A few of us trained with the “kayaktivists” who blocked shipping into the refineries. We arrived with a well-trained “affinity group” trained to engage in civil disobedience. We were willing to risk arrest because we no longer feel that our democracy functions adequately. With the polar ice caps melting, the temperate forests burning, sea levels rising, and records for global temperatures being set every month, we can’t give permission to a purposely dysfunctional government to allow the continuing combustion of fossil fuels. 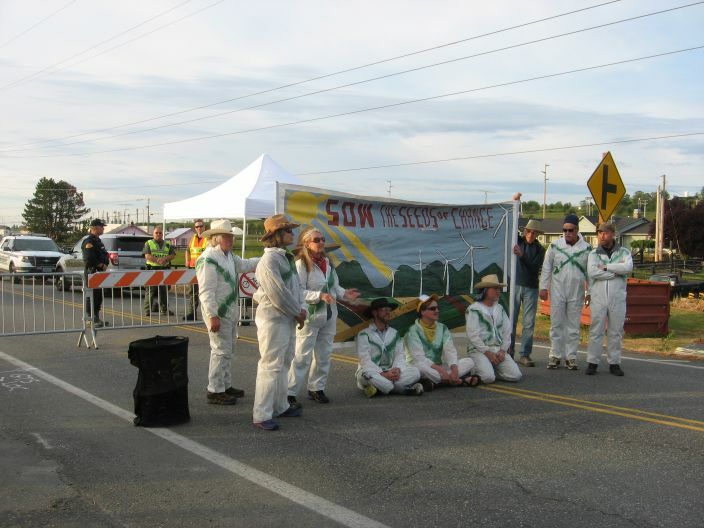 On Friday, the Break Free leadership asked that we create a diversion that allowed 150 people to block the railroad tracks entering the two refineries in Anacortes. So we gathered some banners and marched across a causeway that led from the town to a short bridge leading to March Point, where the two refineries were. A helicopter buzzed us as soon as we started across the causeway, and, by the time we reached the bridge, 30 or 40 police cars arrived and somewhere around 100 police had gathered in riot gear where the bridge landed on March Point. About 200 yards from the police we stopped and unfurled a banner. We chanted. Some UM students led us in songs. The Montana diversion worked! We held the police for 30 or 40 minutes, time enough for the real deployment on the tracks eight miles away. As always it’s hard to measure the impact of the weekend actions. For me personally, I got to share Saturday’s march with my wife, Carol, and my daughter, Julie, who came up from Portland with her significant other. It seemed to me there were lots of other people who had never before attended a political march or spoken out. And I’m more convinced than ever that more uprisings are on the way.
. . . because the most radical thing we can do is nothing, because it ensures that temperatures will exceed the ceiling agreed upon last December in Paris. That fact upsets the normal democratic process. Only citizens asserting their determination to end the expansion of fossil fuels will force the change we need.